Platycerium are epiphytes, growing naturally on branches and trunks of trees in the tropical and subtropical jungles and rainforests of Southeast Asia, Philippines, Indonesia, Australia, New Guinea, Madagascar, Africa and South America (only one species, P. andinum that is native to Peru and Bolivia). There are popularly cultivated worldwide for their fascinating antler-like fronds. Platycerium is a genus of about 18 species, with many hybrids and varieties. Species include semi-desert species – veitchii, growing on rocks, and quadridichotomum; wet season species – alcicorne, ellisii, hillii, madagascariens and ridleyii; and the wet+dry seasons species – andinum, bifurcatum, coronarium, elephantotis, grande, holttumii, stemmaria, superbum, wallichii, wandae and willinckii. These spectacular ferns with uniquely shaped fronds will make an interesting and dazzling attraction in any garden. They are so easy to cultivate and undemanding if given the proper growing conditions that mimic their natural habitats. Among the many species, Platycerium bifurcatum, native to Australia and New Guinea, is the most common in cultivation, easiest to grow and popularly sold in nurseries. 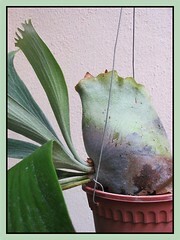 To the right is a photo of our Platycerium bifurcatum in a hanging pot which has been its home for the past 2 years. Since being relocated a year ago to a bright spot with dappled light and where it gets the rain and dew, this attractive fern has been adding more green fertile fronds and looks delightfully healthy and happy. Previously, when located under the shelter of our porch, receiving neither rain nor dew, it was almost bald due to over watering that had caused most of its fertile leaves to rot and detach at the growth point. The thrice-a-week watering schedule then, plus a weekly drench of the whole plant with the garden hose (to remove dust and provide humidity, so we thought?) must have sped the rotting condition. Humph…our inexperience as we experimented with it during the first year almost led to its demise! The foliar fronds, commonly known as fertile fronds, growing from the base of the sterile fronds are green and can be either erect or pendulous, flat and narrow at the base, then spreading widely at the tips where they become deeply forked or lobed with strap-shaped divisions, resembling antlers of a stag or elk, hence their common name, Staghorn or Elkhorn Fern. Brownish patches of sporangia (spore-bearing structures) are produced on the underside of tips of mature fertile fronds. Both sterile and fertile fronds display a whitish fuzz on the surfaces which are covered with fine stellate white hairs that protect them from insect pests and help conserve moisture. 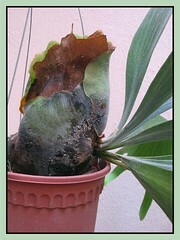 Other Platycerium features include the growing bud that emerges from the rhizome that is hidden under the shield fronds. The bud, located at the frontal center of the shield fronds, together with the rhizome form the life source of the whole plant, producing both the shield and fertile fronds, plus the growing roots and root mass that are protected beneath the shield fronds. Culture (Care): Since Platycerium are tropical and sub-tropical rainforest epiphytes, try to imitate their natural habitat for optimum growth. Light: Staghorn ferns thrive best in bright locations with dappled light and good air movement, especially under the shade of large trees or indirect light at patio or outdoor porch. They can tolerate only early morning sun, so avoid direct sunlight that can burn their fronds unless they are semi-desert species. Moisture: Water thoroughly about once or twice weekly during dry and hot seasons and less during rainy seasons, preferably with rain water. Make sure the medium is quite dry between watering. If unsure, probably best to wait until the fern slightly wilts before watering again. 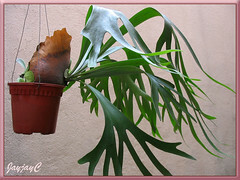 Over-watering can cause the fern to rot or be diseased and die. Identify your species, to determine whether it needs low, moderate or high humidity atmosphere so as to provide better care for your plant. 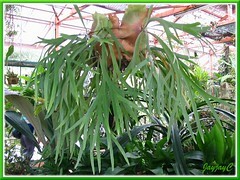 Soil: Use light, well-drained and organic-enriched medium that is most suited for epiphytes. The recommended being a mixture of osmunda fibre and sphagnum moss plus gravel-sized charcoal pieces. Others: Feed sparingly with a quarter strength of an organic liquid fertilizer. They are relatively pest free except for mealy bugs and scale. For temperate zones: Hardiness – USDA Zones 9-11. For more in-depth information on Platycerium’s cultivation, check here. Propagation: From spores which is slow, difficult and impractical for most gardeners. 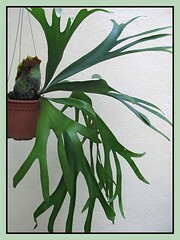 The other best alternative is careful removal of pups from large Staghorn ferns and replant them. Removal: Try to remove a pup together with its root system only when it has produced its own fertile fronds for better survival rate. The fern’s roots are in the basal fronds, so use a sharp knife to cut right through the thickened pad of old basal fronds, dividing the root system well for both the parent plant and the pup, mindful not to damage their rhizome and the growing bud which is its life source. If possible, cut at least a minimum of 3 inches away from their growing points. 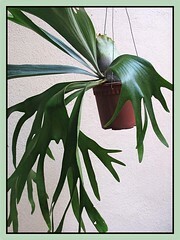 Learn how to propagate Staghorn Ferns using this method here. Replanting and mounting: There are many ways of replanting/growing these pups. 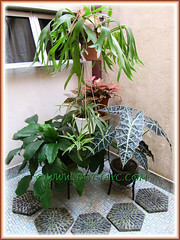 Grow them in hanging pots/baskets with suitable potting medium as mentioned above. Alternatively, the most popular way is to mount them onto palm/tree trunks and branches, dead log or a wooden board and hang in a shaded area with dappled sunlight. To mount, place some moistened sphagnum moss or similar moss at the back of the basal fronds, then fix them onto the mount with encircling fishing line, thin wire, twine or nylon pantyhose, being careful not to damage or tie over the growing bud where new frond emerges. The basal fronds and root system will eventually expand and clasp the growing surface. Check out this site with illustrated mounting instructions. Usage: Grow Staghorn Ferns on palm or tree trunks and branches to add beauty to your garden landscape. Planted in hanging pots or baskets, they will be attractive specimen in any garden, at a patio, deck or outdoor living space. Excellent plant for greenhouses and conservatories too. 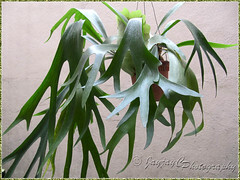 mgonline for more information (especially on how-to mount a Staghorn Fern) and view more images of Platycerium species (scroll right down and click on named species or numbers that are displayed in black for available images). The Platycerium Site from South Africa, by Louwrens Opperman & Roy Vail, covering 18 Platycerium species with much passion. Do explore the site to enjoy the lovely images for all the species and detailed information on some of the various species. Charles Alford Plants – Rare Ferns – enjoy yet more images of the Platycerium species and other epiphytes. Yippee! 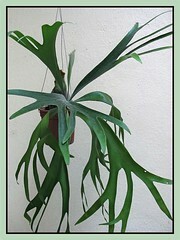 Our Staghorn Fern has finally produced 4 pups! We’re absolutely exhilarated and thrilled! Long have we awaited for this event to unfold and it has eventually arrived after almost 3 years. More lovely images of its babies and how they came about here. Photos captured on April 9 2010 of our Platycerium bifurcatum, showing that the pups have matured very well, a year later. this is the best article I finally can understand. there is hope for our staghoren fern. everyone wanted us to mount it, but yours hanging is similar to ours (ours is a little real sick now). what do we do since it looks as if it needs more moss in the pot, and is it ok that the water runs real quick through it? we live in N. Calfornia where can we buy guaranteed healthy ones on line? Really, really thank you so very much! Regarding your enquiry, I’d kindly advise you to redirect it to the Madagascar Tropicals Nursery whose link is given above for an expert’s advice. Besides having a forum, they even sell staghorns online. All the best to you! I recently acquired a sick looking staghorn. The leaves have all gone pale yellow-green, and there is brown, tough-looking decay on the ends of some leaves (causing them to curl). I beleive the plant wasn’t watered enough. I brought it home, soaked it, and continue to mist the plant 3+ times a week (the air is very dry). The leaves are now turning more green. Should I cut off the brown ends? If the leaves are growing fine now, let them be. But if they are yellowing and turning brown, I’d remove them. If the single leaf is just bent but not bruised, do nothing as some leaves would flop over naturally due to the sheer weight of the outer lobed-sections. Delighted to have been of help. Love your web site. Lots of great info on the staghorn here. I have several of these wonderful plants and they are all in hanging baskets. I have planted them in mixtures of moss, small pebbles( for drainage) and hard wood mulch. The mulch also helps keep the potting mixture loose. They absolutely love this mixture. I have found that these plants like to actually dry out between waterings. Planting them in clay pots also helps with the moisture control. Thank you for your kind feedback, Bob. Really appreciate them. Thanks too for sharing your experience of growing them…the extra information will be most helpful. We’re unable to advise you positively, but just recommend you to this awesome Madagascar Tropicals site to explore and redirect your enquiry to its forum for expert advice. Sorry, this is the best that we can do. 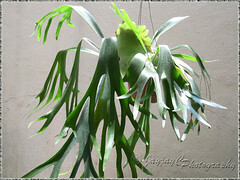 Hi – I rescued a staghorn that had been discarded by a restaurant. The moss and ball were very, very damp, but the three leaves look slightly leathery, and the ends are turning brown and are rather crumpled-looking. It appears to have been properly mounted on a slatted board, and I hung it in appropriate light conditions. The moss is now drying out, but when I press on the shield leaves, they feel damp. I’ve misted the leaves, but that’s all in terms of watering. My concern is that the fern was over-soaked and so the roots are rotting. Does that sound like what has happened? Now that the moss is drying, should I water it (and fertilize it)? Is there any way to encourage its recovery?